Not to be confused with Milly (dog). Mildred "Millie" Kerr Bush (January 12, 1985 – May 19, 1997) was the pet English Springer Spaniel of Barbara and George H. W. Bush. She was named for Mildred Caldwell Kerr, a long-time friend of the Bushes, which is also the name of Kerr's granddaughter, Millie Kerr. Millie was referred to as "the most famous dog in White House history." Bush mentioned her in a speech during his 1992 bid for re-election, saying "My dog Millie knows more about foreign affairs than these two bozos" in reference to opposition candidates Bill Clinton and Al Gore. Millie is credited as the author of Millie's Book, which was released in August 1990 and reached #1 on the New York Times bestseller nonfiction list that same year. In 1989, Millie gave birth to a litter of six puppies with the assistance of U.S. Army veterinarian Stephen Caldwell, including Spot Fetcher and Ranger, who became President George H. W. Bush's dog. Ranger was euthanized in April 1993 due to cancer. 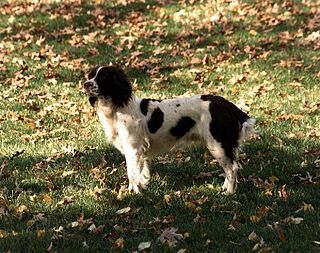 Spot would later become another presidential pet when George W. Bush moved into the White House. Millie was portrayed in an episode of Murphy Brown as well as an episode of Wings and Who's The Boss. Millie also made a cameo appearance in The Simpsons episode "Two Bad Neighbors" in a scene where the former President Bush is jogging with some of his new neighbors. Millie died of pneumonia in 1997 at age 12 at the Bush Compound in Kennebunkport, Maine. A dog park in Houston, Texas is named after Millie. ^ "My Millie is a Famous Dog, Too". The Roanoke Times. 1991-06-01. Retrieved 2008-11-05. ^ Gelb, Leslie H (November 1, 1992). "Foreign Affairs; George, Bill and Millie". The New York Times. Archived from the original on April 5, 2010. Retrieved 2010-03-28. ^ "September 30, 1990 Non-Fiction" (PDF). The New York Times Best Seller List. Hawes. Retrieved 15 March 2013. This page was last edited on 13 January 2019, at 21:18 (UTC).